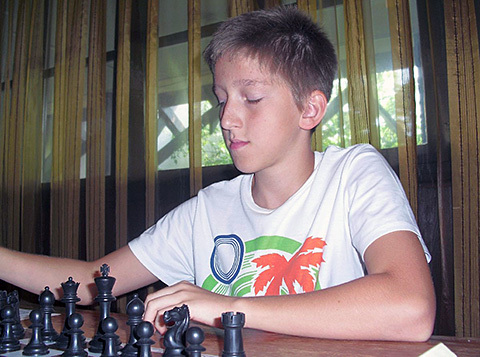 13-yr old Gledura,B (HUN 2336) obtained an IM norm at the recent FSGM tournament in November. Benjamin Gledura (2102) won Gold in Fermo, Italy in 2009, at the World Youth Championship, in the under-10 section. According to a study curried out in the USA, he is considered among the 50 most talented in the world. This sporty young lad is also a champion in swimming. He comes from Eger, a small town in the north of Hungary, which is famous for its swimming sports complex. All Benjamin’s family are amateurs swimmers, but he is the only champion in 50 metres – he won gold and twice bronze medals in his age group. Here is one of his wins that showcase his attacking skills. White played a sideline against the popular Najdorf but this line is well known in Hungary as a pet line of GM Czebe.